We develop and market novel, safe and effective, proprietary Botanical Therapeutics® (botanical based medicines), and innovative support content which target selected, unmet medical needs for disease treatment, management, and prevention. Herborium offers a robust business model designed to capitalize on the changing landscape in the health care sector spearheaded by novel regulatory, market and technological trends, and the cost advantage of natural medicinal products. Herborium’s unique blend of management’s expertise, clinical and regulatory know how in the US, Europe and PRC, diversified proprietary Botanical Therapeutics® portfolio and innovative marketing strategies provide for high-value, high-return opportunity. The Myth: What’s in a Lady? 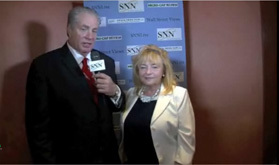 SNNLive with Dr. Agnes Olszewski, CEO of Herborium Group, Inc.